The Schools Chicago’s Students Deserve (Caref & Jankov, 2012) elaborated on many necessities of a quality education. Students need lower class sizes, particularly in the early grades. Current CPS class size guidelines, which are some of the highest in the state, set limits at 28 students for most classes, 31students in 4th through 8th grade, and higher in some non-core high school subjects. Routinely, many classes have more students because the limits are violated. Students need a well-rounded, full curriculum. As part of the fight for a “better day”, not just the mayoral-imposed “longer day”, CTU won art, music and PE teachers for all schools. However, with Student Based Budgeting (SBB), many of those positions have disappeared. With the increased emphasis on standardized testing, tested subjects of mathematics and literacy get the bulk of classroom instructional time, even though research has shown conclusively that art, music, and movement improve students’ reading and math. The option of full-day pre-school for every Chicago family is one strategy that can ameliorate negative educational impacts of poverty. Research is clear that quality pre-kindergarten can have lasting positive effects on achievement, social skills, high school success, and future employment (Schweinhart, et al., 2005). Full-day Pre-K requires increased funding, but will lead to lower costs in the future as many remedial programs and special education services will become unnecessary. Taking into account the push for test-prep curricula and now that “Kindergarten is the new first grade” (Bassok & Rorem, 2014), the pre-K setting and curriculum must be developmentally appropriate and the students taught by early childhood certified teachers. Pre-K classrooms need to engage children in guided play and immersive activities. The Schweinhart, et al. (2005) long-term study of students’ life trajectory, 40 years after they attended pre-K as economically disadvantaged children, highlighted the importance of play-oriented activities and hands-on-learning. Approaches that emphasize collaborative small group activities, investigatory and exploratory experiences, socializing, physical and emotional development, and self-care, as well as inquiry experiences in language development, literacy, mathematics, science, social sciences, and the arts lead students to be successful during the primary grades and beyond. Effective pre-K programs use play-based education: pre-play and post-play activities help students plan, negotiate, and review and, in doing so, develop fundamental reasoning, decision-making, peer negotiation, coping, self-help, and problem-solving strategies. As is typical of his administration’s approach to social issues, Mayor Emanuel plans to expand pre-K by creating profit opportunities for investors and banks. Further, his vision for pre-K falls far short of universal coverage, and subjects pre-K classes to the same accountability systems that have led to decreased emphasis on the arts and play-based learning in Kindergarten and increased reliance on standardized testing and developmentally inappropriate practices. The Mayor’s program to expand pre-K builds on expansion of child-parent centers (CPC) through a social impact bond financing structure. CPCs have been a successful approach and expansion is warranted. However, the planned financing involves sending public money to Goldman Sachs, Northern Trust, and the Pritzker Foundation via social impact bonds. This consortium of lenders will collectively provide $17 million over four years to expand approximately 2600 new CPS pre-K slots (City of Chicago, 2014). Almost ten percent of that funding will go to project management overhead: the project coordinator, the project evaluator, social service providers, and legal and audit services. The remaining funds go to CPS to expand CPCs. Social impact bonds involve virtually no risk for the lenders. They we be repaid, and stand to make a bonus as well, if students in the new slots meet certain benchmarks. CPCs have positively impacted the three benchmarks–kindergarten readiness, third grade reading ability, and avoidance of special education–for two decades (Reynolds, 2000). Because the benchmarks are based on such a long research track record, there is minimal risk to the lenders. As a result, the City and CPS will likely pay lenders the budgeted $26 million and potentially up to $34.5 million, a doubling of the initial investment, to politically connected banks at the same time district leaders claim they are broke. This is the opposite of commitment to fund educational programs aimed at reducing the impact of poverty. It is instead a commitment to divert more funds to the banks and corporations. Among CPS students’ needs are a professionally-staffed library, a counselor with only counseling responsibilities, and a school nurse in every school. Currently, 52% of schools do not have professionally-staffed libraries, 75% of elementary school counselors are assigned to non-counseling, case management duties, and of 322 CPS nurses, only six are assigned to one school full time. Additionally, every school needs appropriate class sizes, starting with classes of 15 to 17 in early childhood (pre-kindergarten to 2nd grade). Students need school stability, which means an end to closings, layoffs, turnarounds, and revolving-door principals. The latest injury to Chicago school children comes from deep budget cuts under the guise of “Student-Based” Budgeting (SBB). SBB changed the district’s funding mechanism for schools, theoretically putting more power over staffing and resource decisions into the hands of the school’s principal. In reality, instead of giving schools more power to tailor resources to their specific needs, deep budget cuts functionally eliminated any reasonable choices. For example, principals had to choose between a librarian and a physical education teacher, when schools need both. This year’s budget stripped $72 million from traditional neighborhood schools (Ahmed-Ullah, 2014). Cut backs are the opposite of what students need. Not only do cuts hit all schools with increased class sizes, reduced program offerings, and special needs support reductions, but the majority of cuts hit schools in low income neighborhoods of color. The students who would benefit most from equalized, increased funding are the ones most adversely impacted by budget cuts (Guryan, 2001; Carter & Welner, 2013). Such cuts hit hardest those who need the most, further exacerbating inequalities. In a measure of funding distribution within states, relative to student poverty, Illinois ranks in the bottom five. (Baker, Sciarra, Farrie, 2014). The state’s funding inequity is related to the fact that Illinois ranks 50th out of 50 states in the percentage of education expenses it funds (Martire, 2013). Education funding is mostly dependent on property taxes, which leads to a compounding of inequality. Such inequality matters because Winnetka’s two school districts have significantly larger resource bases per student than Chicago and the vast majority of Illinois’ school districts. While a student at New Trier High School is supported by almost $1.5 million in property value, a high school student in Chicago is supported by $234, 796 in property value, and a high school student in Cairo, at the southern end of the state, is supported only $33,000 in property value (Illinois State Board of Education, 2014). These disparities ensure that absent equitable changes to school funding at the state level, students in lower-income districts in Illinois will continue to have significantly fewer resources than their wealthier peers. Because of these serious education revenue shortfalls and discrepancies, Chicago compares unfavorably in education funding to other large public school districts in the U.S. An analysis by The Washington Post (Badger, 2014, May), based on 2014 U.S. Census Bureau data, shows that 20 school districts with greater than 40,000 students spend more per student than Chicago, while only 8 spend less. This increased funding has real, tangible benefits. With the will to do so, Illinois could develop an equitable funding policy, with reduced dependence on property taxes. Due to the regressive tax structure in Illinois, high-income households do not pay their fair share in taxes. Illinois has the fifth most regressive local and state tax structure in the nation; middle-class households pay more than twice as much in taxes as the top 1% of households (Institute on Taxation and Economic Policy, 2015). Huge sums are traded by wealthy investors, banks and hedge funds at the Chicago Board Options Exchange (CBOE) and the Chicago Mercantile Exchange (CME), but none of these transactions are taxed. The CBOE alone earned over $400 million in transaction and exchange fees from trades in 2013 (CBOE Holdings, 2014). Schools should receive money based on students’ need instead of the community’s property values, and the wealthy should pay their fair share. A just Chicago would insist on equitable funding policies, including taxes on financial transactions and reduced dependence on property taxes. It would provide full day, developmentally appropriate, pre-kindergarten to all who wanted it, but not use pre-K to enrich financial companies with public money. Instead of cutting school budgets, CPS would guarantee full funding for every school. Caref, C.R. & Jankov, C.P. (2012). 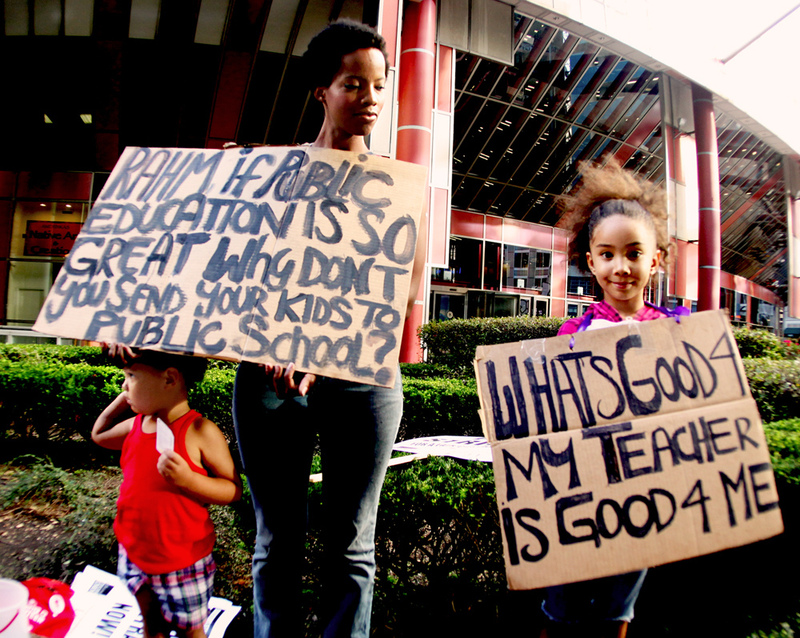 The schools Chicago’s students deserve: Research based proposals to strengthen elementary and secondary education in the Chicago Public School system . Chicago: Chicago Teachers Union. Schweinhart. L.J., Montie, J., Xiang, Z., Barnett, W.S., Belfield, C.R., & Nores, M. (2005). Lifetime effects: The High/Scope Perry Preschool study through age 40 . Ypsilanti, MI: High/Scope Press. Bassok, D. & Rorem, A. (2014). Working paper: Is kindergarten the new first grade? The changing nature of kindergarten in the age of accountability. EdPolicyWorks . Retrieved from this URL. City of Chicago (2014). Document tracking sheet . Retrieved from this URL. Reynolds, A. J. (2000). Success in early intervention: The Chicago Child-Parent Centers , Lincoln, NE: University of Nebraska Press. Ahmed-Ullah, N. (2014, July 3). CPS traditional schools see drop in funding under plan. Chicago Tribune . Retrieved from: this URL. Guryan, J. (2001). Does money matter? Regression-discontinuity estimates from education finance reform in Massachusetts. National Bureau of Economic Research. Retrieved from this URL. Carter, P.L., & Welner, K.G., (2013). Closing the Opportunity Gap: What America Must Do to Give Every Child an Even Chance. US: Oxford University Press. Baker, B.D., Sciarra, D.G., & Farrie, D.. (2014). Is school funding fair? A national report card. Newark, NJ: Education Law Center. Retrieved from this URL. Martire, R.M. (2013). “For each and every child” —And why funding reform is crucial to enhancing student achievement. Chicago: Center for Tax and Budget Accountability. Retrieved from this URL. Illinois State Board of Education (2014). Simulation of SB16. Retrieved from this URL. Badger, E. (2014, May 23). The dramatic inequality of public-school spending in America. The Washington Post. Retrieved from this URL. Institute on Taxation and Economic Policy (2015). Who pays? Retrieved from: this URL. CBOE Holdings, Inc. (2014). Form 10-K (Annual report). Retrieved from: this URL.